My fascination with machined metal products continues with this new brand, Inventery, and their take on the minimalist pen, simply called the 'Mechanical Pen'. Inventery is a minimal design brand with a small, curated selection of everyday goods and accessories. My thanks to Inventery for sending these over for review! Before I talk about the actual pen, a few words about the packaging are justified I think. Some brands go to outrageous lengths to provide an impressive unboxing experience, but then it sometimes starts to feel as if the packaging cost more than the pen itself. Inventery provides that same wow-factor, but in a more balanced fashion. 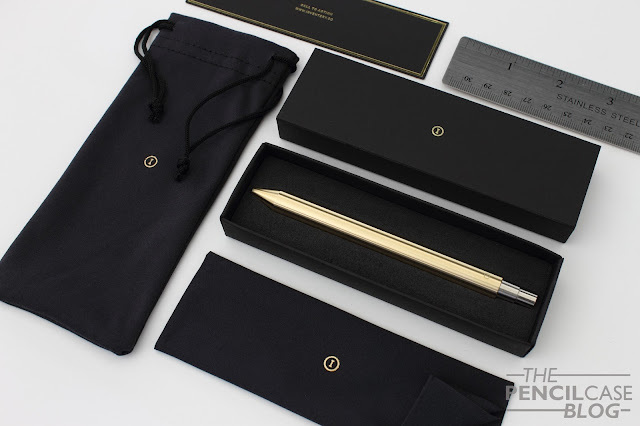 The simple cardboard box that houses the pen is packaged in a drawstring pouch and includes a polishing cloth. 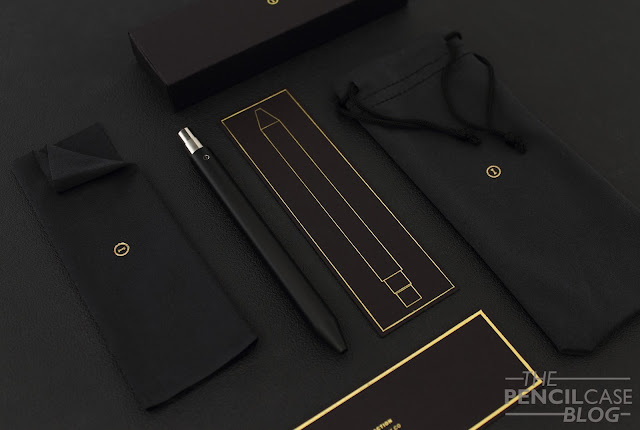 Inside the box you'll find a card with the pen design embossed in gold foil, and the website information on the other side. Everything is embossed with the Inventery logo in gold. The all-black theme with the gold accents is super classy, and the pouch and polishing cloth are actually useful accessories. Yet despite the features and very nice finish, the packaging remains compact and simple. Some of you probably couldn't care less about the packaging, so let's move on to the actual business: the Mechanical Pen! The more minimalist a product is, the more I like it. But at the same time, it becomes increasingly difficult to talk about it. 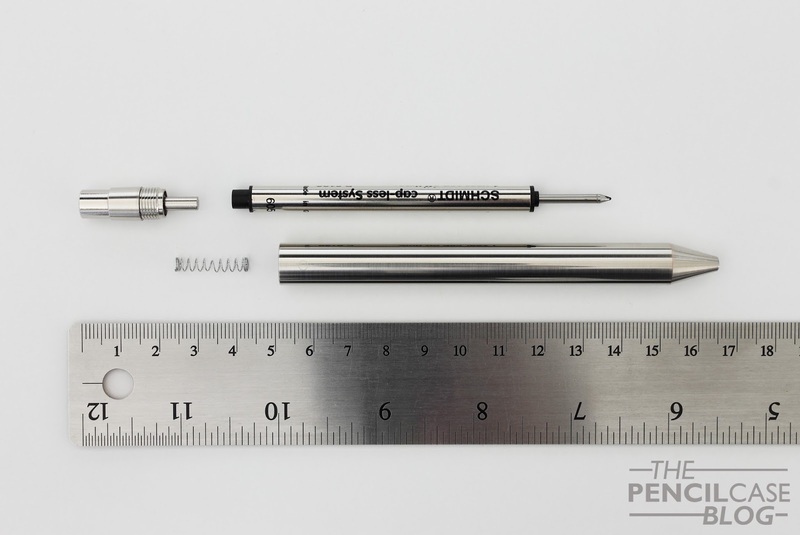 The Mechanical Pen is VERY minimal. 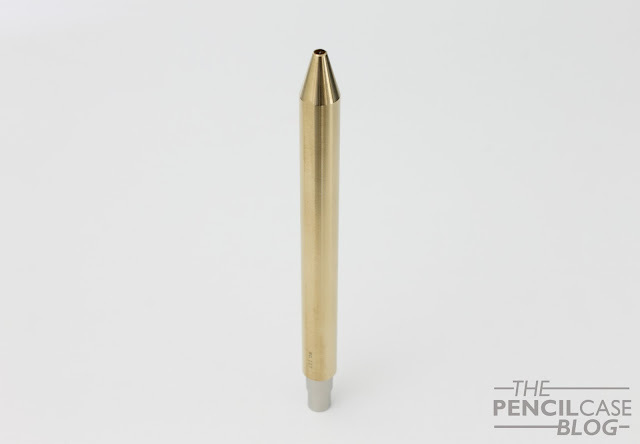 The straight cylindrical shape and short conical tip are as basic as it gets, and are made from a single piece of brass (all finishes have a brass base, but more on that later). The Schmidt mechanism screws in at the back, and provides a color contrast with its chrome plated finish. 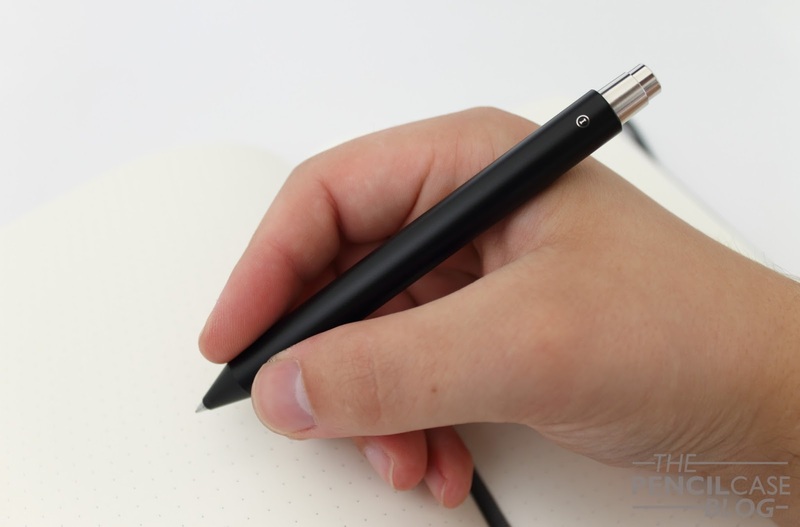 The relatively short length of the pen gives it a more stout and robust appearance, yet the overall shape is sleek and clean. 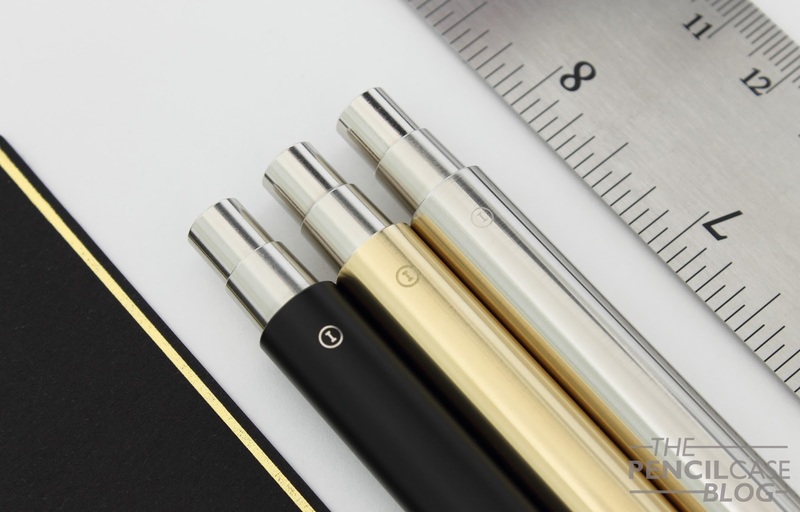 The pen is available in four surface finishes: black oxide, polished chrome, brushed chrome and raw brass. All of which are applied to a brass base. The matte black looks sleek, and the matte texture gives the slightest amount of grip. The brushed chrome version has a very subtle brushed finish. I expected it to be a bit more pronounced. Something I quite enjoy is that it shows the brass base on the edges and corners. Where the chrome plating has worn down from applying the brushed finish. But then again, the finish is not 'rough' enough to provide grip. Last but not least, the raw brass is -as always- a personal favourite. Even though it can be quite slippery at times, I do enjoy the nice patina it creates. On a simple design like this, every flaw is immediately noticeable. Luckily I couldn't find any on the three pens I received. Attention to detail is high, as it should be. The edges are machined precisely, and the surface finish is smooth and even. No machining marks are visible. Except for on the brass version, but of course that's what you get with a 'raw' finish, and I quite like the industrial look it creates. 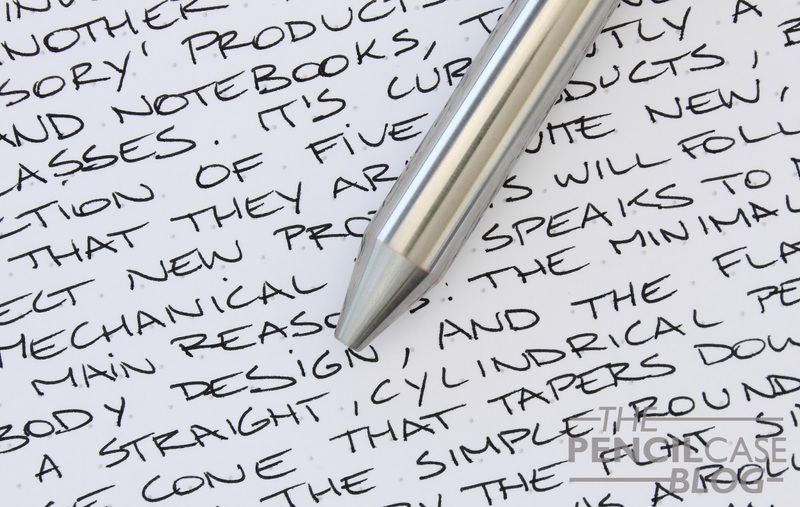 The most important design aspect, and the feature that sets the Mechanical Pen apart from other minimal writing utensils, is the flat side. 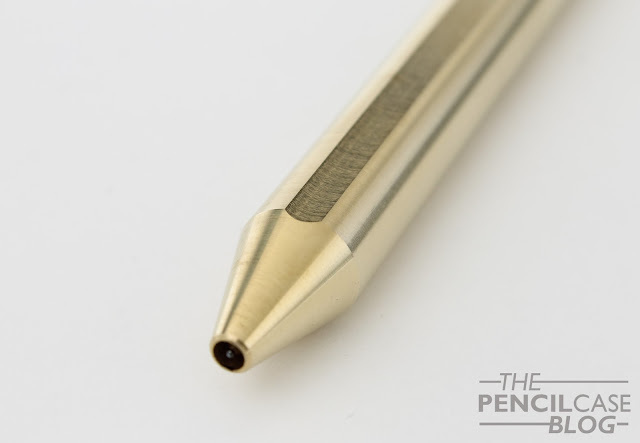 The profile of this pen is not completely round, instead a flat side is machined along the length of the body. It's very subtle, visually, but it's a surprisingly functional feature. You see, the decision to go clipless is an obvious choice when making a minimal writing instrument. But it's always a downgrade in terms of functionality. The flat side partially takes over the functionality of the clip, namely making it less likely to roll away on you. But of course it doesn't help when you want to attach your pen to something. A clip design like the one from Karas Kustoms, or schon DSGN wouldn't have looked misplaced on a pen like this I think. That being said, Inventery does explicitly market this pen as a 'desk pen'. 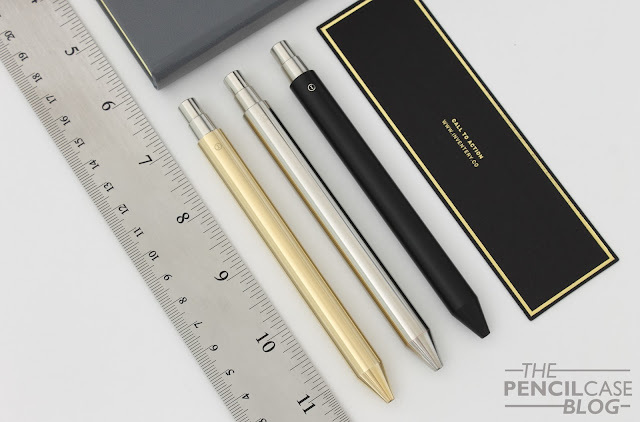 If you want to carry your pen around with you, they suggest using a case or pen sleeve. As I already briefly mentioned, the Mechanical Pen is not overly large. It measures in at 12.5 cm (5") long, and has a diameter of 1.1 cm (0.43"). It's roughly the equivalent of a pocket pen like the KarasKustoms EDK or Baron Fig squire, but it feels a bit girthier. I always say the sweet spot for a fountain pen is 5". Same applies here, so for me it's full-sized enough to be used comfortably. 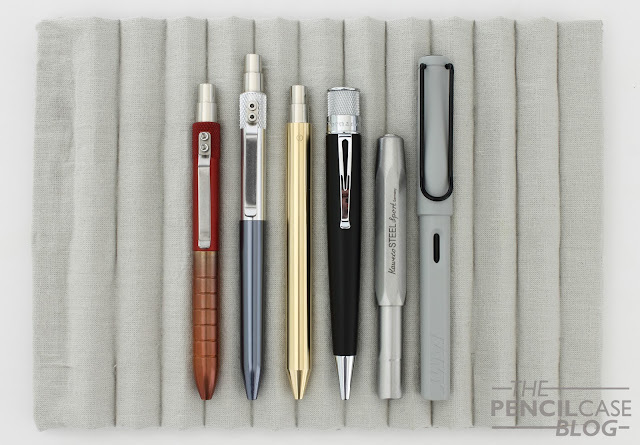 Weight is an important aspect of these pens, as they are all made from solid brass. This of course means that you can expect a heavy pen, coming in at 57 grams. The weight, in combination with the rather slippery body, isn't the best combination in terms of comfort. Definitely something to keep in mind. 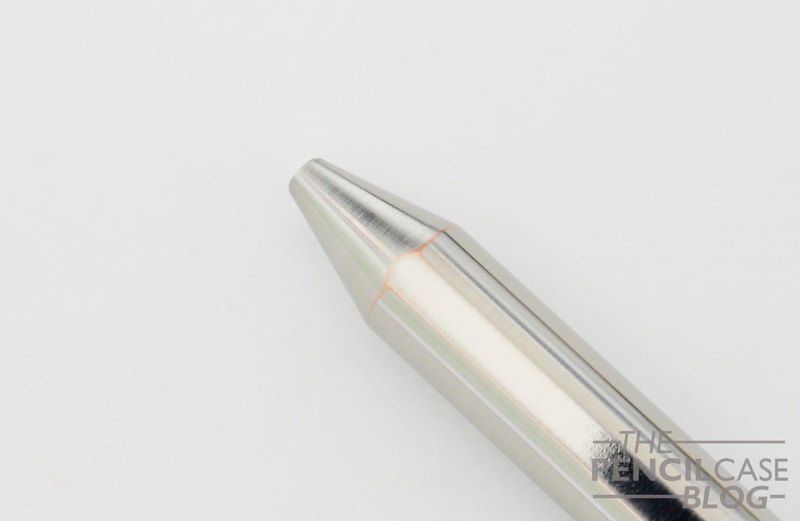 The Mechanical Pen utilises the -almost industry standard- Schmidt click mechanism. There have been reports of the mechanism wearing out after extended use, but so far I haven't had any issues with it (and it's also easily replaceable if needed). The mechanism is silent and acurate. The tip is machined to a tight tolerance, which means there's no annoying clicking or rattling sound when you write. It comes loaded with a Schmidt P8126 rollerball refill, which is another excellent choice in my book. The refill lays down a fine, crisp line. And the ink is black and consistent. It remains one of the only rollerball refills that actually works well for me, so no complaints there. 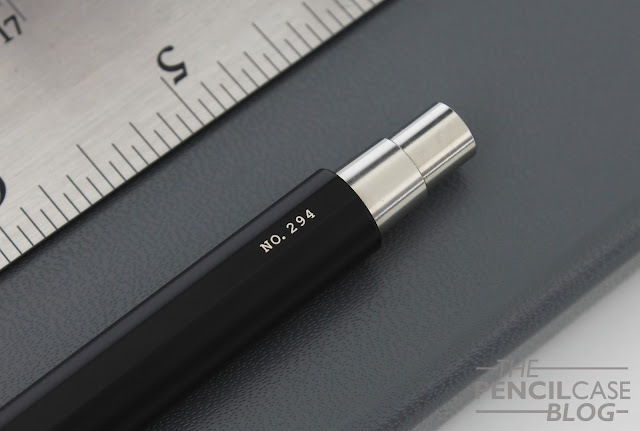 The Inventery Mechanical Pen showcases some of the most pure and minimalistic design that I've seen in a long time. The build quality and presentation is spot on, and the incorporation of a flat side is a clever feature that keeps it from rolling away. That being said, the very straight and industrial design will certainly not appeal to everyone. The price... well let's be honest: 90 USD is a steep price. It's a good chunk more than comparable pens, such as the Baron Fig Squire, or Karas Kustoms EDK. This is a pen you'd buy for the aesthetic, as a design piece for your desk. If you're looking for functionality, or a practical pen for everyday use, this wouldn't be my first pick. Note: This product was provided by Inventery, free of charge, so I could write this review. I was in no way influenced in the making of this review, the opinions shared in this review are completely my own! This post does not contain affilate links.